With sectarian tensions, weak institutions and yet another political crisis possibly in the making, the situation in Pakistan looks more dire than ever. Shiite Muslim taking part in a Ashura procession in Hyderabad, Pakistan. Demotix/Rajput Yasir. All rights reserved. In 2013, it may not be Iran or Syria or Egypt that poses the gravest danger to international peace and stability but rather a nuclear-armed state with more people and bombs than all three of them combined: Pakistan. With sectarian killings of Christians and Muslims, economic crises, the indoctrination of its youth, and its use of terrorism as a tool of foreign policy, Pakistan will face nothing short of an existential crisis in the coming years – the end result of which may be state failure. Born in 1947 to ostensibly protect the Muslim minority on the Indian subcontinent, Pakistan’s Muslim minorities, principally the Shia Hazara, are now routinely targeted and killed in a country whose name literally means “land of the pure.” Over the years, Sunni fundamentalists and their backers in Pakistan’s intelligence service, the ISI, have narrowed the definition of who is pure and who is not, with Christians, Hindus, Indians, liberals, Shia, and Ahmadi Muslims firmly in the unpak or impure category. 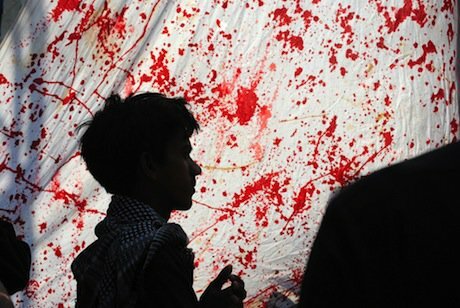 Shia Muslims ­— who make up one-fifth of Pakistan’s population and count in their ranks Pakistan’s founder, its current President, its first female Prime Minister, and a host of intellectuals, poets, and musicians — have been targeted so regularly by extremists and scapegoated by Pakistan’s conspiratorial media that their very disappearance has become routine. Last month, the International Crisis Group counted 87 fatalities, many of them conducted by the Pakistani Taliban. 2013 has started even worse, with over 100 Shia Muslims killed in Quetta by Lashkar-e-Jhangvi, a terrorist group bent on expelling the Shia from Pakistan. Other minorities do not have it any better. Ahmadi Muslims, a heterodox sect, are not considered Muslims under Pakistani law and are targeted even more conspicuously than Shia and are bizarrely linked to Israel by many Pakistanis. To take the most recent example of Ahmadi rights being trampled upon, on December 3, 2012, over one hundred Ahmadi graves were desecrated in Lahore. The reason? Ahmadis were non-Muslims and were thus not allowed to have the Islamic prayer written on their tombstones. To simply blame extremist parties, however, would miss the point and exculpate Pakistani society, which itself has moved in a more fundamentalist and xenophobic direction. Today, 50 percent of Pakistanis do not consider the Shia to be Muslims and Pakistani textbooks have expurgated their history and contributions to the state. Mullahs preach about the infidelity of Muslim minorities in mosques and open ears willingly listen to their dictums, thereby creating the political and cultural space needed to scapegoat their fellow Muslims without reprieve. The grotesque irony is evident: a state founded by a minority to protect Muslims now openly slaughters them. If a house divided against itself cannot stand, a house killing its own members will surely collapse. Educating the young is one of the few fundamental duties of the state. Pakistan, by teaching schoolchildren hateful propaganda and untruths is failing current and future generations, fostering the radicalization of its youth, and in the process creating the diggers of its own grave. It is precisely because of her desire to spread female literacy that Malala Yousefzai, the young advocate for literacy and education, was targeted by the Taliban in October, 2012. After she was shot in the head, a Taliban spokesman was quick to label her advocacy for female empowerment an “obscenity.” Leaving aside the fact that girls’ education and not bullets to the head (or acid to the face, another weapon of choice for the Taliban) has been deemed obscene here, members of Pakistan’s religious and political elite began to circulate conspiracy theories about the incident: Malala was a CIA spy; the Pakistani government surreptitiously conducted the killing. Former cricketer and prime ministerial candidate Imran Khan was quick to condemn the killing but was silent on the killers. The leader of the Jamat-e-Ulema-e-Islam party – one of Pakistan’s most prominent Islamist organizations – went so far as to deny the fact that the shooting took place. These types of conspiracy theories and rejectionist attitudes merely highlight the sheer irrationality of Pakistan’s most prominent politicians. If both an aspiring prime minister and the head of the largest Islamic political party cannot state the obvious, how can Pakistanis and the world trust them with thermonuclear weapons and wars on two fronts? Of course, Pakistan’s problems extend far beyond sectarian killings. Inflation is expected to be in the double digits in 2013 and GDP growth “insignificant,” according to the International Monetary Fund. Tax evasion remains widespread and starts right at the top. On the question of foreign policy, the 'S-Wing' of Pakistan’s intelligence agency has been funneling support to the Taliban and other militants in Afghanistan since this War started, in the process undermining every shred of Afghan self-government. For years, Pakistan sought to control events in Afghanistan under a doctrine it termed ‘strategic depth.’ While security analysts bent over backwards to justify this as realpolitik, it was nothing more than the de facto occupation of Afghanistan and its reemergence may be nigh as the United States leaves Afghanistan in 2014. So, Pakistan now stands at the crossroads. With so many crises happening at once, the future of international security and peace on the subcontinent rests on the decisions of ordinary Pakistanis and the state they call their home.